May | 2017 | Chubby For Life? My father died on Memorial Day in 1967. That was fifty years ago. That is hard for me to fathom. Fifty years ago. I was ten. He died drunk driving in Sheffield Village, Ohio leaving behind a wife and seven children, including two year old triplets. I could write page after page about this and perhaps someday I will (but not on a bicycle blog). He served as a radioman on a bomber in the South Pacific during WWII and I have silk maps that he carried with translations to Japanese such as, I am an American, etc. The morning of his death I carried the American flag in the Memorial Day Parade; the world was never the same. I got a nice message from woman asking if I still ride and for permission to use one of my photos on local township page. It was nice to be asked and I gave permission as long as I received photo credit. As for, do I still ride? Since I retired nearly six years ago my life has been in a constant state of flux. My brother was sick and I did what I could until his death eight months later. Then my mother was diagnosed with lung cancer and I took care of her until she succumbed. Immediately after another brother was diagnosed with mouth cancer and I took care of him for a long time until his eventual remission. All during this time I was giving care to my elderly father-in law. Much of this was bittersweet as I did all of his cooking and care. I learned how to cook and enjoyed our time together. He died in February. For the first time in the long time since I retired I was free from obligation. I threw myself into my hobbies; chess, guitar, writing and poker. I ended up winning an $11,200 seat to the Main Event of The World Series of Poker. Everything is working out perfectly. My wife is retiring at the end of the month so her and my daughter can go with me to Las Vegas in July. I hope to do well and as far as I’m concerned I’ve already won. It’s going to be great. Getting back to cycling. I was out a bit in February and April but right after I won the seat to the WSOP I came down with a horrible case of gout. I’d had it a couple times before in my big toe but nothing like this. My entire foot swelled and even with medication it didn’t go away for three weeks. It was the kind of misery I wouldn’t wish on my worst enemy. I went to my doctor and he said, “Don’t feel bad, it happens to a lot of old fat guys with poor diet.” This was a serious wake up call. I am making changes. 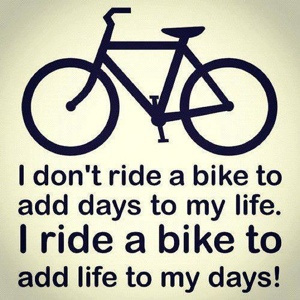 The weather has been rain, rain and more rain but I will be on the bike soon.